I ordered the new AppleTV (4th generation) as soon as it was offered for sale last month, and I’ve had it installed in my office for about two weeks now. Two-sentence summary: I think it’s going to be huge, and it’s going to define the TV experience in much the same the iPhone has defined the smartphone experience. 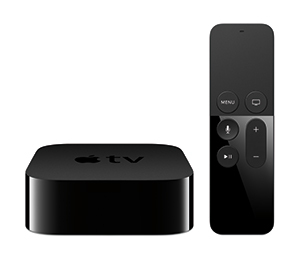 The new AppleTV is really cool, but that’s mainly because I see its potential. Its reality today is nice, but not fantastic — probably much like early iPhone users described that device back in 2007-08. Today, there aren’t many apps available and the existing ones are hard to find. Sure, Apple lists the most popular free and paid apps right in the AppleTV interface, and they’re starting to categorize apps as more are added … but that hints at one of the problems. As far as I can tell, there’s no easy way to find out what new apps are available. There are no websites covering AppleTV apps and nothing else (at least none I know of), and I’m not seeing much coverage of new apps from Apple websites. There are few enough apps right now that, if there are 10-20 new apps added in a given day or week, I’d like to know about them. But that’ll eventually change, I think. I think TV apps is the future. I love the experience of turning on my AppleTV and being able to immediately load and play Asphalt 8: Airborne, a super cool car racing game. It’s an infinitely smoother experience because the game/app is loaded right in the AppleTV, unlike … say … the Playstation 3 out in the living room, which runs off of CD/DVD-based games. If I want to play Madden 16 on the PS3, after I turn it on, I have to check if the Madden disc is in the machine. It’s probably not, because my son might’ve been playing NBA 2K16 or Call Of Duty or something else. So I have to go find the Madden disc, eject whatever’s in there, put Madden in, wait for it to load, etc., etc. It’s not smooth. AppleTV apps are smooth. I love the idea of having all (or most) of my favorite iPhone and iPad apps available on my TV. Clash of Clans on a 42-inch HDTV screen? Yes, please. Tweetbot, Kayak travel search, Blab video chats … even Facebook (!) on my AppleTV? Yes, please. One of my favorite apps is already available for AppleTV. Well, several are … but the one I’m talking about here is Periscope. 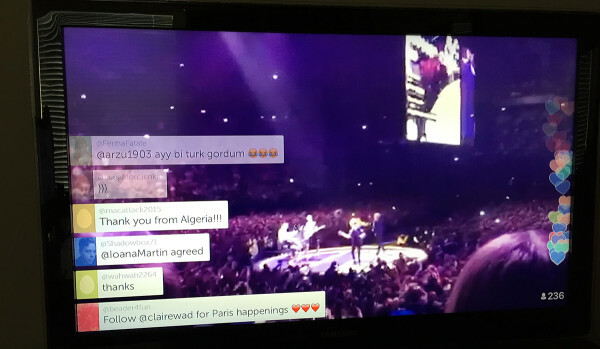 I do the occasional live video stream on Periscope, but I mostly use it to consume video, primarily from U2 fans streaming the concerts they’re attending. It’s very cool to watch and listen to a live U2 show on my office TV. The audio and video quality is impacted by the fact that connectivity in large arenas is usually terrible, but that’s not AppleTV’s fault. A normal Periscope stream from some non-crowded event looks and sounds great. But the Periscope app itself still has plenty of room for improvement, too. You can’t login to your Periscope account, for example, which means there’s no easy way to find and watch live streams from the Periscope users that you follow. And there’s no way to search for streams by keyword or hashtag. Instead, the app shows anywhere from 5-10 popular live streams from various cities around the world — Rome, Paris, New York and so forth. If you’re into watching random live streams from people you don’t know, it’s great. But most times, I’m not into that. Fortunately, this week I’ve been able to easily find U2 concert streams among those popular/random options. 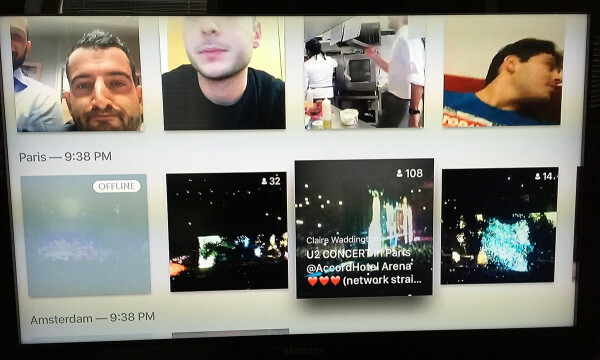 In so many ways, the Periscope app experience is emblematic of the overall AppleTV experience: filled with more potential than current greatness. Here’s hoping both the app and AppleTV itself continue to move from “pretty cool” to “great.” I’m confident they will. Tell Me, Costco Travel … How Do You Really Feel About Timeshares?